Traditionally project management is reflected in scheduling tools such as Primavera, Open Plan or Microsoft Project in which the dimensions of time and cost are set out in Gantt Charts and Pert Charts that show the sequence of work, summary and detail tasks and in some cases the critical path will be tracked. Scheduling tools do not patently show the consequences of risks other than time or cost overruns. CorProfit provides a solution with how risks are set in context and by implication deals with the range of consequences that are contended with daily by project managers. For example; consequences may be legal liabilities, breach of regulations, poor quality workmanship (defects), injury to workers and damage to the environment which go beyond merely the financial loss and time delays that scheduling tools calculate. CorProfit’s approach is to align Risk Management to traditional Project Scheduling so as to ensure checks and balances as never before, to trap out the “killer risks” that are still going undetected or where there are insufficient response measures to quickly deal with events that are underway. Trend is more to proactive risk management to prevent issues as opposed to reactive measures to “put out fires”. Provides a means to aggregate risks in project delivery, assisting to keep risks within contingencies, and summarised by type of project. 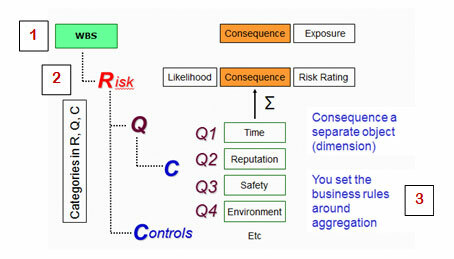 Build better knowledge about risks, and which risks tend to result in “eating up” most of the contingencies allowed for and by implication which controls are the most effective. Build a Knowledge Base of risk data that delivers a consistent approach to risk mitigation, able to be harnessed through templates and lead to greater accuracy of analysis through application of risk management. Target resources more effectively through risk and event prioritisation and clearly see which controls give the “best bang for the buck”. The KnowRisk® Projects Module provides an end to end process of establishing a project portfolio, a Knowledge Base technology that you populate with risk data and the means to report on. This gives a “running start” by which you can use the Methods for Managing Project Risks as-is, or you can adapt these as needed to suit the nature of your operations before implementing the solution.